Let’s get one thing out of the way up front: most of the problems that plague public transit — broken-down vehicles or canceled bus trips — can be laid at the feet of the MBTA and its aging infrastructure. But — you know it to be true — some part of your daily commuting frustrations can be blamed on your fellow riders. And, if we’re being really honest, maybe some of theirs can be blamed on you. Transit etiquette can be categorized in one of two ways. Some bad manners simply make a commute less pleasant. But others can actually disrupt T operations, leading to the types of service delays that exacerbate a bad ride. Neither category is desirable, said Jodi R.R. Smith, a Marblehead-based etiquette consultant who has ridden subway systems worldwide. The T recently launched a series of videos at subway stations asking passengers to practice good etiquette — if only to ensure the trains run on time. “The items that would create a service delay or affect the safety and security of our customers are the ones that are a priority,” said MBTA deputy general manager Jeff Gonneville, who hopes the video campaign will cut down on bad manners. An example: there are garbage cans on practically every T platform, so don’t throw your trash on the tracks. That’s a common cause of track fires, which cause delays. Riders should also be sharply aware of their place in a big geometry problem. Anything that’s going to make it harder for riders to squeeze aboard trains or buses already at or near capacity is a big no-no, because it will slow service, Gonneville said. Take the hurried passengers who crowd train doors on the platform, trying to board before letting departing riders off. All they’re doing is further crowding the train, cramping up the doorways for a few additional precious seconds before the train can depart. Replicate that up and down each line, and it accounts for some of the T’s notorious delays. Similarly, once you’re on-board, you should move all the way into the train and clear away from the doors. If you’re lucky enough to snag a seat, don’t be greedy: your belongings shouldn’t sprawl beyond your one seat. Nor, for the manspreaders among us, should your body. And if you’re wearing a backpack, take it off and put it by your feet. Then there are those types of behavior that may not delay a train, but are annoying all the same. 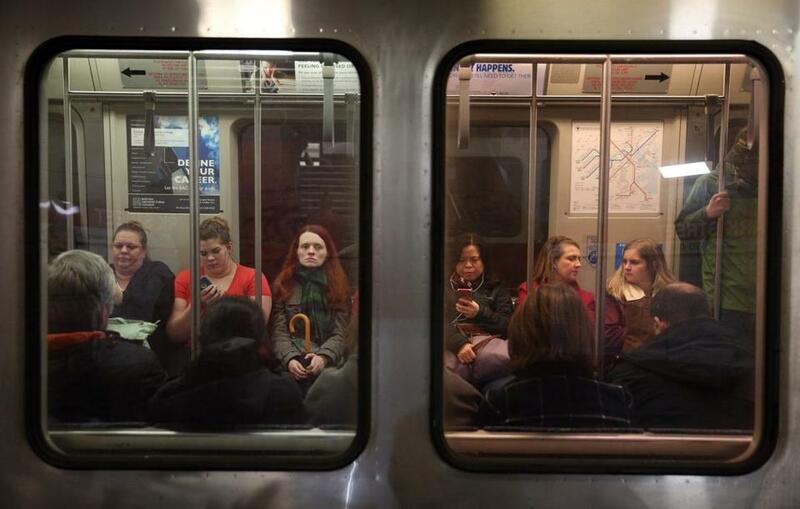 Commuters sit on a Red Line train at the Park Street T Station. Gonneville recommended riders use “common courtesy” when determining their own behavior on the train. Food, drink, loud music, and loud conversation are all listed as commuting activity to avoid on a T etiquette website. Other transit systems are more blunt. Toronto’s, for example, launched an etiquette campaign that specifically called out loud music, stinky food, and body odor as shame-worthy. “An adult shushing an adult is uncomfortable for both adults,” reads the system’s cheeky, illustrated etiquette guidebook, which — honest to goodness — clocks in at 100 pages. But Smith, the etiquette consultant, said confrontation may be appropriate, if you strike the right tone. Tone also is important if you find yourself on the offending side of an etiquette breach, she said. On a hot August day, for instance, you might not smell particularly great, and you might have little choice but to reach upward for a grip on the subway. Now, does that sound like a Boston subway rider or what?